On the horizon, a revolution in farming technologies promises to transform the ways in which we produce our food. This shift can dramatically reduce the volume of chemical inputs used and if we get it right, supports a transition towards a more regenerative approach to farming: one that builds healthier soils and increases biodiversity. The opportunity is enormous. With our food and farming systems facing unprecedented challenges ahead, what role do robots and precision farming play in the future? There are many factors driving technological shifts in food and farming, from water and land availability to climate change and a collapse in biodiversity. I’ve written about some of these deep and complex challenges before. There are also many inefficiencies within existing farming practice to be addressed, such as the over-application of chemicals and soil erosion. These challenges are inspiring a wave of new technology start-ups, aiming to offer solutions to some of these deeply complex problems. This piece covers some of the themes in emerging agricultural technologies. My motivation is to make better sense of what these might mean for farmers, citizens and our ecosystems. A few months ago, I spoke with Professor Simon Blackmore who heads up the Robotic Agriculture department at Harper Adams University. Here they focus on precision farming and robotics and no doubt have a lot of fun building them! In 2017, they famously achieved a “hands-free hectare” where everything from ground preparation and drilling, to plant care and harvesting was completed without a human stepping onto the land. Professor Blackmore’s view is that while the past trend in farm machinery has been based on economies of scale with tractors getting bigger and bigger, the future will be about smaller, more nimble machines. These machines will operate autonomously, moving intelligently around the crops. They will be ultra-light to avoid soil damage and enable a major reduction in the application of chemicals. Robots for scouting, weeding and harvesting. Images designed by Blackmore. What struck me in his work is the amount of reduction that can be achieved. The video below demonstrates a sensor that can intelligently recognise different species of plants and either zap them with a laser for weed control or apply a micro-droplet of chemical to a leaf, achieving a 99.99% reduction in the volume of herbicides. Currently, the majority of chemicals coming out of a boom sprayer are missing their target altogether (with around <5% efficiency). This is impressive and the technology isn’t just conceptual. Already, several companies are offering solutions in this space: Blue River Technology (USA) is developing robots that use computer vision to “see and spray” at weeds. Deepfield Robotics (Germany) have a robot which stamps weeds into the ground as an alternative to using herbicides. Ecorobotix (Switzerland) have an ultra-light, solar-powered autonomous weeder. Naio Technologies (France) have various bots for weeding, as do the Small Robot Company (UK). Rootwave (UK) are pioneering electrical weeding robots. The technology is already available for those willing to pay. What does this mean for farmers? A few things. Farmers purchasing far fewer chemicals and spending less time going up and down their fields. Tractors able to work around-the-clock, autonomously and meticulously over the crops. I don’t believe this technology designs farmers out of a job, it will just shift how they spend their time. This is an example of robotics performing crop care. For managing land, there are generally three other categories of agricultural robotics: scouting (e.g. collecting data on soil, plant and other environmental conditions), drilling (planting out) and harvesting. Let’s explore some of the others. Farming is becoming increasingly digitised, enabling practices to be more reactive to local conditions such as weather, soil characteristics and micro-climates. Satellite monitoring, drone-captured imagery and remote sensing are enabling collection of pinpoint field-based ‘nearly-live’ data. 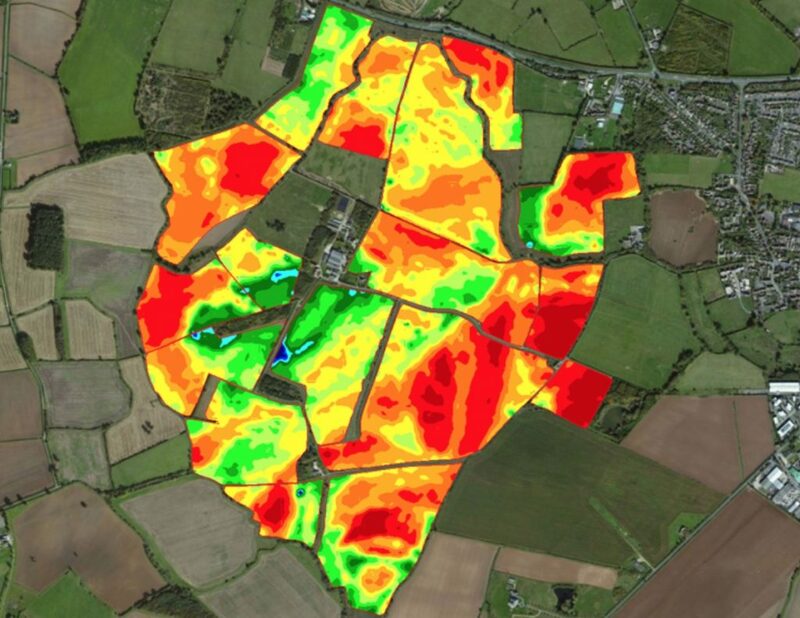 The software then provides farmers with bespoke prescriptions to help work each field, down to a fraction of an acre. While it’s still early days in their development, many farmers are already adopting precision technologies. Many companies, such as Soyl provide field mapping services enabling farmers to apply variable rate application of fertiliser. Teralytic builds wireless sensors that detect 26 different parameters of soil health, giving farmers a detailed map of soil conditions across their farm. Farmer’s Edge is a hardware and software product that uses satellite imagery and precision technology to help growers identify, map and manage farmland variability. To date, the start-up has raised $94.3 million in funding. For integrated pest management, examples include Semios and AgroPestAlert who offer networks of camera-traps, providing farmers with automated pest counts and notifications. McCain Foods recently invested in Resson, which uses near real-time predictive analysis for crop management. Farmobile enables farmers to collect and then sell their field data to third party’s. Sector Mentor for Soils is a well-rated app, particularly suited for hands-on soil analysis. What does this mean for farms? Ultimately, it’s about optimising resources, building better soil health and achieving better yields. Some of the current challenges include data interpretation, dealing with multiple, disconnected data sources and an inability to connect data to agricultural machinery. There are also issues around data ownership, transparency and trust in the large companies that use the data, leading to responses such as the Ag Data Transparency Evaluator in the USA. For many crops, harvesting has long been a mechanised process and this trend continues across the world. However, for the more delicate crops, hand-picking is still dominant. It’s taken Boston Dynamics 26 years to build a robot that can open a door. As I write, even the most advanced robots are still bulky and struggling with delicate movements, but we know this will change. In some countries, this is being driven by labour shortages, where local people are unwilling to take on the intensive, poorly-paid harvesting jobs. Last year the startup, Abundant Robotics raised $10M from investors including Google Ventures and Yamaha Motor Ventures to develop apple-picking robots. Octinion is developing a strawberry-picking robot. While not a harvesting robot, Augean Robotics have developed a neat autonomous, rugged cart robot that can follow a person around and haul things for them. Other companies include Harvest Automation, Kespry, Lely and the Autonomous Tractor company. One of the possible benefits of harvesting robots is selective harvesting to reduce food waste: with robots programmed to assess the quality and quantity of harvestable produce, only harvesting what is sellable. Other than that, these advances are about saving costs, with questionable benefits for labour. Pessimists see these advances as bad for jobs. While advocates believe robots can eliminate the worst jobs, while increasing food production, maintaining food costs and reducing the environmental impacts of farming. There’s an interesting question about how quickly these different technologies will come to market as affordable propositions – and when they do, for whom will they be available? Taking a general look at technology, we can see that it has been distributing itself more and more rapidly. For example, it took 46 years for electricity to mainstream and only 7 for the world wide web to do so. What’s supporting the pace of agricultural tech development is the rapid advances being made in artificial intelligence, data analytics, robotics and sensors: all of which are converging to provide a suite of new tools. However, the rate of technology adoption is not just governed by its availability. When it comes to big pieces of equipment, traditionally, farmers make large investments that take many years to pay off. As such, they can be locked into equipment and their associated practices. This lock-in can mean farmers are slow to change and wary of investing in new systems, especially ones that dramatically shift their practice. These new technologies may not follow this trend though. Water constraints and a push towards sustainable intensification will drive uptake of new technologies and incentives for their uptake. We are also talking about smaller pieces of kit, many of which are suitable for smaller farms, not just large, industrial farmers. There’s also changing business models for products too, with some companies offering products on a per-hectare subscription rather than one-off investment. Many of the robots can work to a 2cm accuracy (using RTK navigation) meaning that every seed can be placed precisely and mapped. This can support multi-cropping practices that can aid natural pest control and improve biodiversity and yields. Scouting and crop care technologies can help optimise irrigation, increasing water efficiency. Designers should also consider that the majority of farms worldwide are small-scale and the importance this has for food security, local economies, livelihoods and biodiversity. So how can these technologies be made affordable and accessible for small-scale producers as well as the large ones? And finally, how can these technologies assist farmers to make better, more informed decisions? It’s an exciting time for farm technologies. Let’s hope they scale to reach their full potential, as technologies guiding us towards healthier, more resilient food systems.